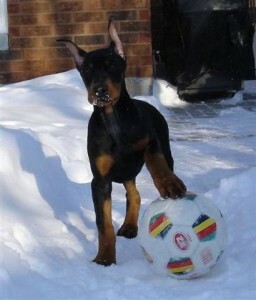 Dobermans have always been a part of my life although I didn’t have my own until my early 20s. Growing up, our neighbour had a doberman named Princess. While I was riding, a doberman was always nearby. My first two dobermans of my very own were from less than reputable breeders. Both passed away very young, both of wobblers. This started our search for a reputable breeder. Our first registered doberman was Cricket. 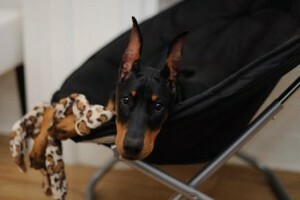 We have not been without a doberman since then. In 2002, we registered our kennel name “Gatehouse”. In 2012, we received permanent registration from the CKC. 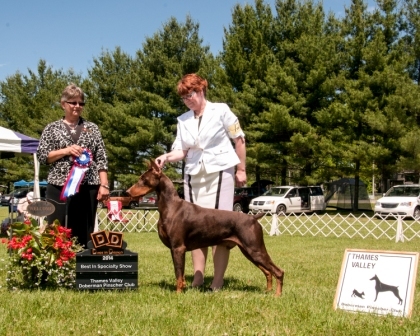 We are proud to be able to say that we have bred, owned and handled two dobermans to Best in Show awards. Our dogs have passed the Temperament Test (a test that evaluates the dog’s temperament against its breed standard), Working Aptitude Evaluation, and some have Canine Good Neighbours, Canine Good Citizens, Obedience titles and very importantly two are working as service dogs for their owners. I belong to the CKC, the Doberman Pinscher Club of Canada, the Doberman Pinscher Club of America, the United Doberman Club and the Grey-Bruce Kennel & Obedience Club. I am also a Canine Good Neighbour Evaluator. Our dogs are fully health tested and we try to keep the testing on our website current. This of course does not mean that our dogs are always healthy and will never have a problem. No one can ever guarantee that. As reputable breeders we utilize the most up to date testing that we can to ensure that the dogs we breed will produce sound, healthy puppies. Should an issue arise, we have a written health guarantee that comes with each puppy. We are happy to discuss our dogs and believe in being very transparent. This goes for both prospective families looking for a puppy, and for other breeders looking for information on our dogs. If you are interested in a puppy from us we ask that you complete the questionnaire (on the “litters” page).